Featuring yet again another smash hit for the My Father Cigar, Inc. group, Jaime Garcia Cigars (pronounced HIGH-ME) are made from top notch, Nicaraguan tobacco, delivering the signature, full bodied knockout blow of a smoke we all come to expect from My Father Cigars. Jaime Garcia, of course, is the son of the cigar master, Don Pepin Garcia. 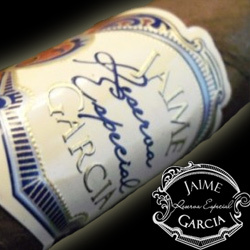 Little known fact is that Jaime Garcia has been involved with every cigar ever created at My Father Cigar Inc. since day one, but it wasn’t until this self-titled cigar line that Jaime crafted his own cigar. One thing to note is that Jaime Garcia Reserva cigars are always in high demand, which makes them hard to keep in stock. The Jaime Garcia Reserva Especial cigar features a bigger ring gauge than most cigars, with the Belicoso sporting a 52 inch (132 cm) ring. The ring, just like the taste, is big, so be sure to stock up on the Jaime Garcia Cigars because they are a future favorite if they are not already.